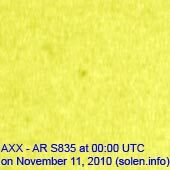 Last major update issued on November 12, 2010 at 05:30 UTC. 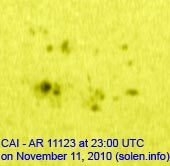 The geomagnetic field was quiet to active on November 11. 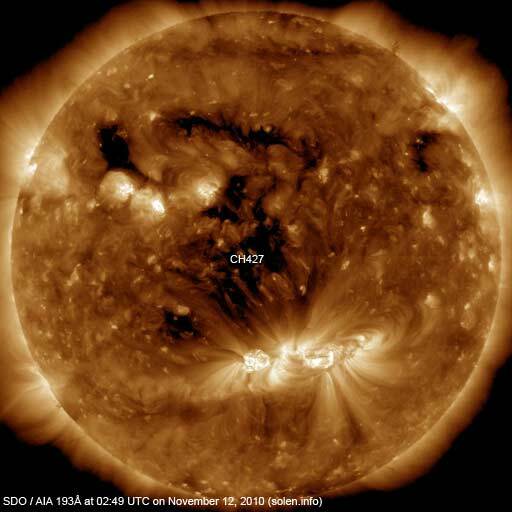 Solar wind speed ranged between 307 and 528 km/s under the influence of a high speed coronal hole stream. 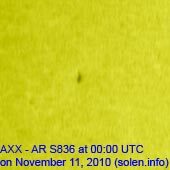 Solar flux measured at 20h UTC on 2.8 GHz was 84.5 (up 2.3 over the last solar rotation). The planetary A index was 15 (STAR Ap - based on the mean of three hour interval ap indices: 14.8). 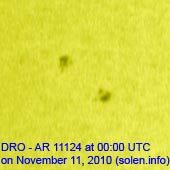 Three hour interval K indices: 31234324 (planetary), 31234324 (Boulder). Region 11123 decayed slowly losing some penumbral area. 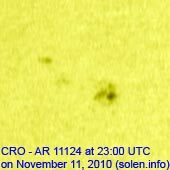 Flares: C2.9 at 02:14, C4.7 at 07:24, C4.3 at 16:16 and C1.1 at 19:30. 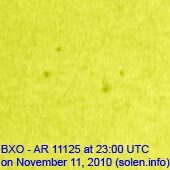 Region 11124 produced a couple of B9 flares and may be capable of C class flaring. 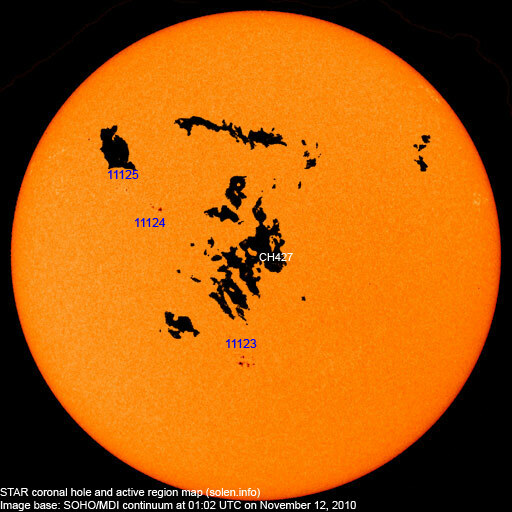 New region 11125 emerged in the northeast quadrant on November 10 and was numbered the next day by NOAA/SWPC. November 9-11: No obviously Earth directed CMEs were seen in LASCO or STEREO images. 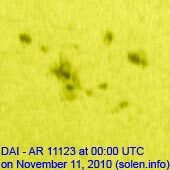 The geomagnetic field is expected to be quiet to active on November 12. Quiet conditions are likely on November 13-14. Quiet to unsettled conditions are possible on November 15-16 due to effects from CH427.